The cast stands in a circle on stage, balls flying through the air, quickly changing hands as names are called. This is how rehearsal begins, with a little warm up game. It helps loosen everyone up, both physically and vocally while also challenging everyone to remember each other’s names. “And we’re back!” Leah Taylor, the stage manager, yells. Responses of “thank you, back” come from all over the theatre as actors take their places. Meier takes her seat in the audience, this time in the portion facing the stage head on. As she waits for the shuffle of feet to die down to indicate that the actors are all in place, she pulls out a yellow notepad and pen to take down notes. “Lights up!” Taylor says, signaling the start of the play. Dawn Sellers, one of the production’s musical directors begins to play the harpsichord as the actors file out onstage for the opening number. This opening song is one of the few moments when the whole cast in together on stage. Sellers said it was important to include everyone in this piece because it helps being them together. For most of the rehearsal, Meier sits quietly in the audience, taking down notes to give the actors later. She interrupts occasionally fix the blocking and staging. When Meier does give critiques, they are given kindly. Generally soft spoken, Meier is approachable. Her lack of an intimidating presence invites the actors to experiment with new and different things. Even when they fail or don’t work, she simply brushes it off and suggests another approach. One of the greatest examples of an actor’s experimentation is Patty Gallagher’s antics as Autolycus. Gallagher is one of the main sources of comic relief in the show and actress is doing her best to show that. Her songs are backed with Amiel’s music and together the pair elicit laughs from their fellow cast members as Gallagher struts around with a fake guitar, instructing Amiel to play for her. During rehearsal, Gallagher made multiple over the top acting choices; tuning her “guitar,” berating Amiel for not listening, rocking out to the music which eventually ends in her doing the splits. Nearly everything she did had the cast bursting with laughter. Meier praised her work but stayed clear in her vision and shot down an idea to come air guitar a portion of the song. “That’s not where the joke is.” Meier said. 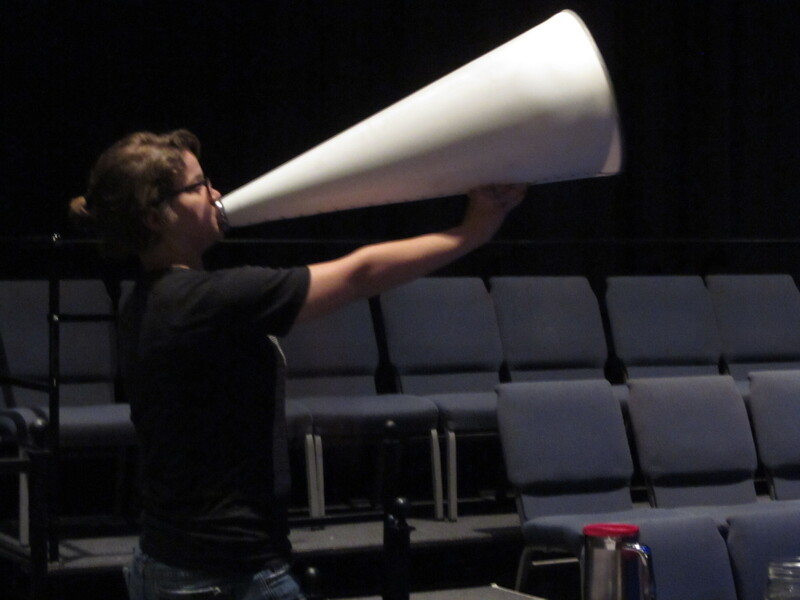 At a previous rehearsal, Leah Taylor had called an end to the break by blowing into a small horn. Today, she’s upgraded. “Places everyone,” she says.